One of the more dramatic scenes of political and religious reform preceding the Protestant Reformation owed to the preaching of the late fifteenth-century Dominican, Girolamo Savonarola. A famous mendicant preacher who combined republican politics, millenarian prophecy, observant monasticism, humanist learning, and biblical theology, Savonarola found himself at odds with the Roman curia and the powerful Medici family, eventually resulting in his condemnation and execution. Born September 21, 1452, to a banker father, Girolamo was the grandson of a noted physician to the dukes of Ferrara. He set out for a career in medicine himself, studying in the arts faculty at Ferrara, but had a sudden change of heart and took monastic vows. He joined the Dominican order in 1475 at the convent of Saint Domenico at Bologna and began the study of theology. By 1479, he became master of novices to Santa Maria degli Angeli convent in Ferrara before moving to the San Marco convent in Florence, where he was reader and lectured on Scripture. Savonarola’s stay in Florence lasted until 1487, when he left to become master of studies at the Bologna Studium. This first period in Florence, however, established him as a notable preacher and biblical scholar. He attracted much attention for his sermons. Fiery like other popular mendicant preachers of the day, such as Bernardino of Siena, he intertwined deeply biblical emphases on Christ, grace, and justification with excoriating moral critiques of his contemporaries. He preached not only in Florence, but served as a Lenten preacher in San Gimignano, where he began proclaiming that the church would need to be purged and reformed. He continued preaching this cautionary prophecy while in Bologna before the famed Florentine noble, Lorenzo de’Medici, brought him back to Florence again as reader at the San Marco convent. Savonarola’s return to Florence initiated a period of intense and controversial reform on both religious and political levels. Soon after returning in 1490, he would become prior of San Marco in 1491. The support he had from the Medicis provided him important clout for his reforms. He remained on good terms with Lorenzo the Magnificent until the patriarch’s death in 1492. The following year, it was with the support of Lorenzo’s oldest son, Piero de’Medici, that Savonarola was able to established San Marco as a reformed congregation within the observant movement of monasticism. These early years back in Florence, however, gave rise to Savonarola’s most infamous moment. Sometime between 1492 and 1494, he claimed to have received a vision about the future of Florence and the church: he prophesied that a king like Cyrus of Persia would come to purge the church, in particular the sinful pope. This vision found its fulfillment for Savonarola in late 1494, when Charles III of France came through Florence on his path to take Naples. Denied entry by the Medicis, Charles threatened to sack the city. Though compromise was reached that deterred an attack, the Medicis were driven out of rule in the city and a republicanism modeled after Venice was established with Savonarola’s help in December 1494. He saw Charles as the means God was using for the reform of the church—starting with the Florentines. This occasioned another significant change in his public rhetoric. He came to adopt a millenarianism that saw the church moving toward a state of purification, and this purification had begun in Florence with the arrival of Charles. 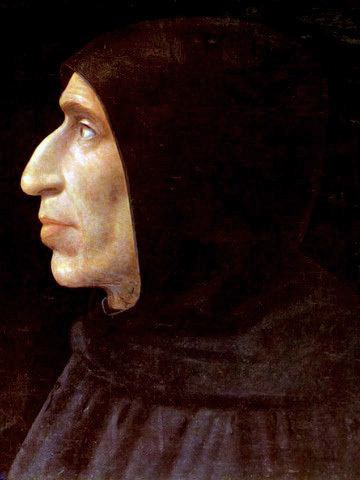 Savonarola’s role in the new government also gave him license to impose draconian moral reforms on the city. His civil reforms included strict regulations governing family life, lay brotherhoods, homosexuality, blasphemy, Jews, secular festivals, gambling, and prostitution. He held an increasingly common “bonfire of the vanities,” burning illicit books, pictures, clothing, and other irreverent fare. He also established the first Monte di Pietá, a pawnshop dedicated to helping the poor and sick, which would eventually be sanctioned by Lateran V (1512—17). Contrary to perception, however, many of Savonarola’s measures were unpopular and were routinely opposed by Florentines. In one instance, he was even challenged to prove his status as prophet with a trial by fire (which was fortuitously rained out). As a critic of the Roman curia and supporter of a pro-French policy in the north, Savonarola found himself at odds with the notorious Borgia pope, Alexander VI. The pope summoned Savonarola to Rome to answer for his teachings, but the famous mendicant preacher declined. He also refused Alexander’s injunction to stop preaching. As a result, Savonarola was excommunicated and the people of Florence threatened with interdict for harboring and supporting him. He and two fellow friars were captured, tortured, and questioned. Under pressure Savonarola confessed to false prophecy and political conspiracy, recanted his confession, and then confessed again. On May 23, 1498, he and his associates were executed by hanging, and their bodies thereafter burned. Savonarola’s legacy far outstripped his short time in Florence. Politically, his republican vision lasted amongst the Florentines for another thirty years before Holy Roman Emperor Charles V forcibly restored the Medicis to power. Culturally, he attracted and influenced Renaissance artists ranging from Botticelli to Michelangelo. Intellectually, the academy at San Marco that grew up around him spawned an important group of humanists (including Govannia Pico della Mirandola and Marsilio Ficino) committed to biblical and patristic studies, as well as translations of Greek and Hebrew. Theologically, his views were passed down to important Italian reformers such as Gasparo Contarini or Gianfrancesco Pico, and Luther himself would later commend Savonarola for a concept of justification strikingly similar to his own.